Trying to save some time on busy weeknights? This recipe can be prepped in advance and doesn't require much active/standing at the stove cooking time. 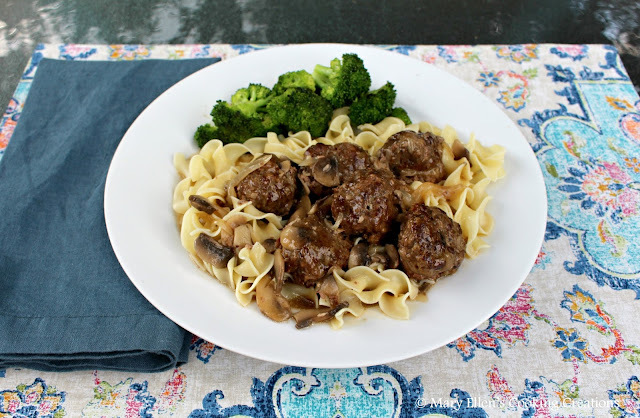 I was really craving Salisbury steaks last week - it's something about that mushroom gravy! But the thought of standing at my stove frying the steaks, all of that splattering grease on a clean stove, and then the smell your house gets after frying beef was enough to make me rethink that plan. Then I had an idea - why couldn't I just turn the steaks into meatballs? 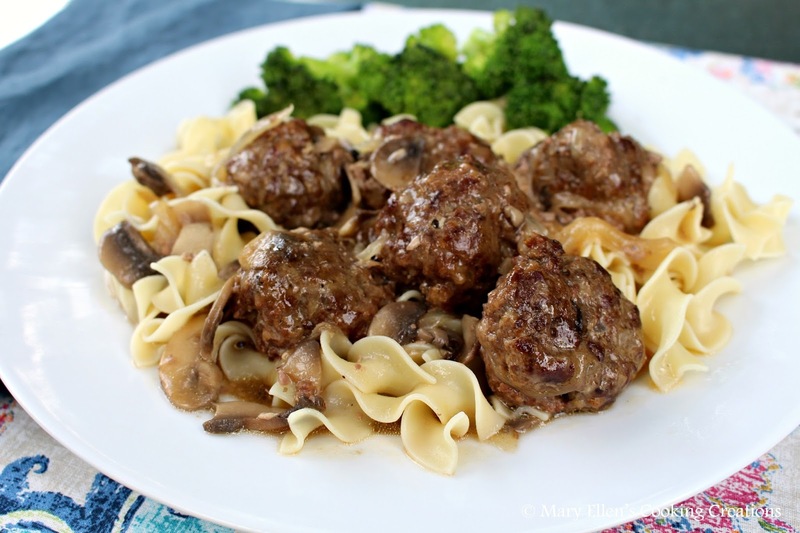 I could bake the meatballs and then just simmer them in the gravy. It worked perfectly. I was even able to prep a quick pot of soup for lunches for the week while my meatballs were baking. 8oz of fresh mushrooms stemmed and sliced; I used baby bellas. White mushrooms would work too. Line a cookie sheet with tin foil and spray with cooking spray; heat oven to 375 degrees F.
In a large bowl, mix the beef, onions, Worcestershire, ketchup, egg, salt and pepper. Slowly add the breadcrumbs, using more or less as needed until you have a moist mixture that comes together when you form a ball. Form meat into small meatballs; I was able to make 20 small meatballs with 1 lb of beef. 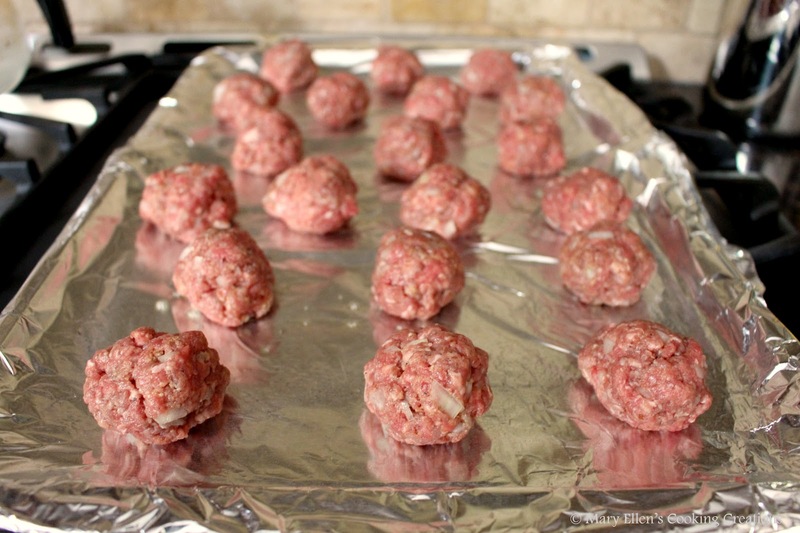 Place meatballs on the cookie sheet and bake for 20 minutes, turning once. In the meantime, make the gravy - heat butter and oil in a large saute pan over medium heat (I used a non-stick pan). Add onions and mushrooms; saute 3-4 minutes. Add the broth and Worcestershire - stir to mix well. Season with salt and pepper. Bring to a low simmer. NOTE: to really thicken your sauce, add the broth a little at a time instead of all at once. Add some, stir, repeat until you have used all of your broth. 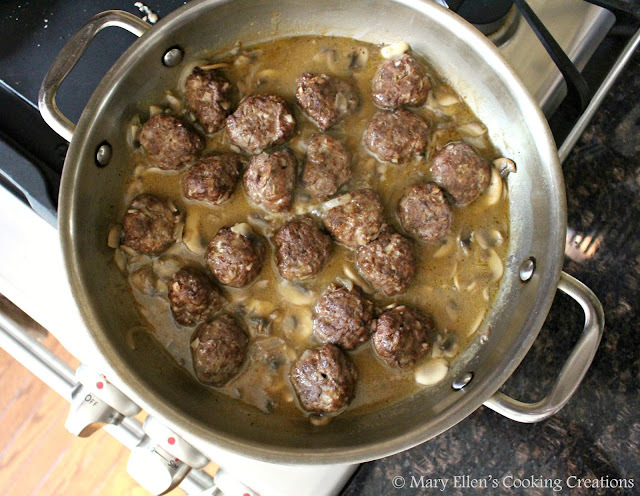 Once the meatballs are done, add them to the gravy. Allow to simmer, partly covered, until you are ready to eat (simmer at least 10-15 minutes).